As you may have seen, a longtime Tesla bear and short seller recently made a full, high-speed, screeching U-turn and starting supporting Tesla. The explanation included 4 CleanTechnica charts regarding Tesla sales versus the competition’s sales. I’ll take this opportunity to shamelessly plug becoming a CleanTechnica member, supporter, or ambassador to help us do the independent cleantech reporting and analysis that we do. If you wanted to monitor and investigate human insanity in a large societal format, I’ve got a few political groups I could recommend (including one down in Brazil and one right here in the US of A). But sticking to the topic of this article, I have to admit that I find Tesla short sellers an enjoyably fascinating case study. Naturally, they are part of the wider stock market case study, which is an absolute wonder of the world. Let’s dive in. The first question, and one we commonly skip over, is why one analyst — like Citron Research — changing its opinion on a firm/stock results in so much of a shift in the investments of others. If you’ve invested a large portion of money — or, for example, if a group of you have invested $1.11 billion collectively — on thorough financial analysis, why would someone else’s shift in assumptions make you change your investment. Do you not have your own assumptions solidly planted and based on actual news? It looks like Tesla really can produce cars. And it turns out a ton of people genuinely do want to buy them. And this years-long hype about competitors eating Tesla’s lunch seems to be more fantasy than anything else. But why did $1.11 billion follow Left’s move to the other side of TSLA? Do many short sellers not actually do their own research? Do they not have their own assumptions and spreadsheets to justify their bets? Or did all of them somehow “wake up” and come to the same conclusions at more or less the same time and thanks in part to Left’s new take on the story? Rather than assuming they all updated their spreadsheets, though, there’s another way to explain the $1.11 billion change of heart based on Left’s report. There’s a funny assumption that most stock market positions are based on solid financial analysis and spreadsheet conclusions. I’m not the first to point out, however, that much investment is based on emotions and mass socio-psychological analysis. Investments shift all the time — and in very large quantities — based on what people think other people think about a company (or the economy as a whole). Actually, massive amounts of money shift based on what people think other people think other people think about a company. Perhaps short sellers didn’t care what Andrew Left thought about Tesla, but perhaps they thought other people cared a great deal about what Left thought. Such is the nature of large groups of humans. Naturally, timing was a big factor in this story. Andrew Left came out with his dramatically revised conclusions after Tesla released 3rd quarter sales and just before it released 3rd quarter financial summaries. Anyone who had been following the story closely should have seen that Tesla actually sold far more cars than short sellers were expecting and that the margins must have been pretty high on those cars, given the versions of the Model 3 the company was selling (and not selling). All you had to do was take those numbers and plug them into a simple spreadsheet and you could see Tesla was likely to be profitable. Yet, either short sellers didn’t dare do so or they didn’t dare believe their eyes after doing so. Then along came Left, who said, “Hey, this is sort of wild, but Tesla makes a lot of money.” (Not a real quote.) That woke up some sleeping bears who decided that, okay, it was time to go terrorize some other company. But some bears are deeper sleepers than others. While $1.11 billion might have decided it was time to stop being skeptical on Tesla, billions more remained short. Even after Left’s research note came out and gave Tesla stock a bump, 33.79 million shares were still shorted ($9.94 billion worth of them), meaning that Tesla was still the most shorted U.S. stock on the stock market. At the time that Reuters article about the $1.11 billion loss was written and it was assumed that the initial effect of Left’s change of heart was settled, Tesla’s stock price was $288.77, and Tesla had not yet released its Q3 financials and shareholder letter. Tesla released those after the market closed on Wednesday, October 4. The market closed at $288.50 that day and opened at $317.38 the next day. Tesla’s numbers were good, very good, and more investors came to the conclusion Left had landed on a few days earlier. The stock price is now up to $334.85. Who knows what the future holds? The stock market is volatile and Tesla stock is much more volatile than most — a “roller-coaster ride” that, ironically, gravitates to the same metaphor commonly used for riding in a Tesla. But a few things are clear. First of all, in the short term at least, Citron Research’s decision to bail on its short position just before Tesla’s Q3 report and conference call was a financially fruitful move. Tesla’s stock price is up a whopping 27% at the moment compared to a week ago. By swinging all the way from short to long, Citron Research must have made a nice chunk of change. Additionally, anyone who quickly followed Andrew Left’s lead must have made some good money as well. Jumping from $288.50 to $334.85 ain’t half bad, even if it doesn’t match a move from $263.67 to $334.85. So, while my note above that it’s sort of ridiculous to change your position on a company based on someone else’s assumptions and spreadsheet conclusions, the cold truth of the matter is that doing so is sometimes an effective way to read the market and be ahead of the curve. In other words, it’s not all about math — it’s also about psychology and sociology. As a final note, the thing that many of these Tesla short sellers don’t seem to realize is that Tesla longs aren’t “playing the market” like they are. 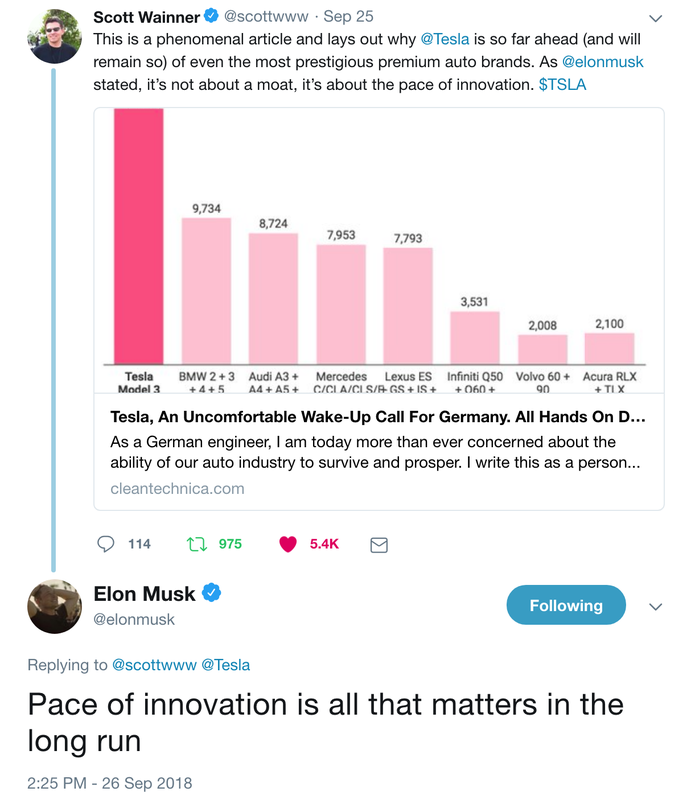 Tesla longs — of which I am one — have determined that Tesla is a solid company with an excellent leader, a tremendous track record of executing on its goals, and unmatched expertise innovating on electric vehicles and clean energy (which are market segments we see rising strongly in the coming decades). Whether we came to the conclusion yesterday or years ago when the stock price was $30, we assume that Tesla will keep growing as it continues to produce the best electric cars — well, the best cars overall. We expect that sales will keep growing strongly as more people find out what a Tesla is. Some of us don’t fret about short-term changes in the stock price, and certainly don’t try to pump it up, because we just assume the market as a whole will eventually come to understand the Tesla story. We assume more people will come to understand that Tesla’s on-the-ground financials (including real-world assets) will improve year over year as Tesla continues to innovate. Tesla’s stock price rose from $30 to $100 as more people consumed the Tesla story, and many of us assume it will grow from $330 to $1000 in a similar fashion over time, even if that means occasionally dropping 25% based on human fear, uncertainty, and doubt. Another thing we assume is that more of the market will sooner or later start trusting Elon Musk, the unofficial “Nothing of Tesla,” more than Tesla short sellers. There’s still approximately $10.97 billion of short interest in TSLA. Andrew Left may have … left. Others may have followed him based on his new take on Tesla. But it appears that $11 billion not only doesn’t buy the story, but specifically buys the story that Tesla is going down. If the Tesla story gets better and better, what happens to that $11 billion?